1. First, toast the gram flour. 2. Mix together all the marinade ingredients, and stir in the toasted gram flour. Coat the paneer and broccoli with the mixture and refrigerate for 1-2 hours. 3. 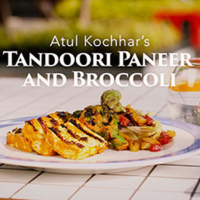 Cook the marinated broccoli and paneer on a hot griddle pan or barbecue until charred – it will only take a couple of minutes each side. Baste regularly with oil. If you prefer, you could roast them in an oven preheated to 200°C, gas mark 6 for 7-10 minutes. 4. Sprinkle with lime juice and serve hot. Great served with a green salad. This recipe was first published in June 2016.